Toronto-based platform Maker’s Movement is releasing the second issue of their print publication, Magazine’s Magazine, and want you to help them celebrate! This issue explores the many moods of the morning and how its ritual and energy are experienced and communicated by creatives around the world. 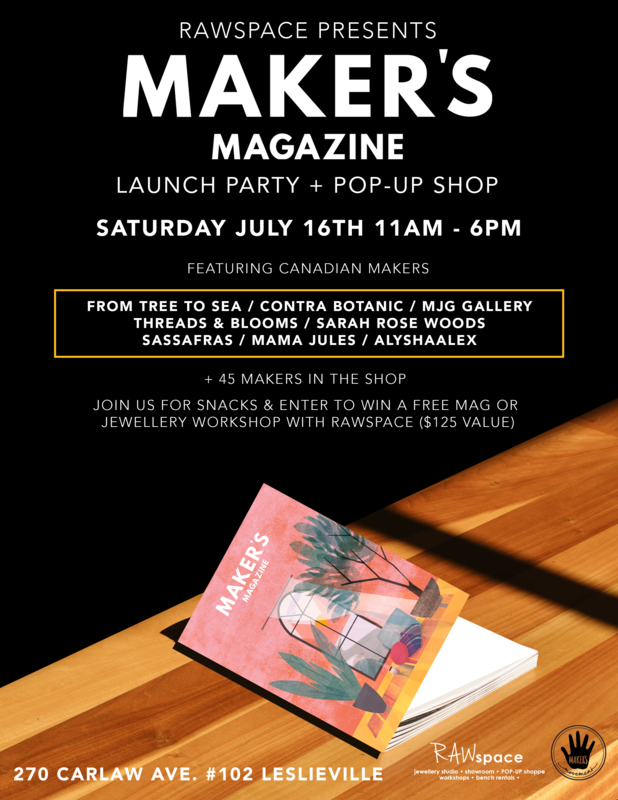 Swing by RAWspace (270 Carlaw Avenue #102) this Saturday between 11 a.m. and 6 p.m. for the Maker’s Magazine Launch Party + Pop-Up Shop to shop an awesome collection of vendors and makers, munch on yummy snacks, and enter your name in their free raffles for a chance to win a magazine and a free jewellery workshop with RAWspace ($250 value). Featured vendors are From Tree To Sea, Contra Botanic, MJG Gallery, Threads & Blooms, Sarah Rose Woods, Sassafrass, Mama Jules Embroidery, and ALYSHAALEX.